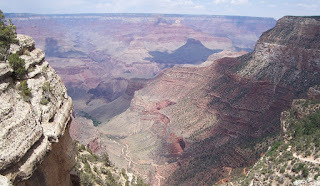 When we had decided to go to the Grand Canyon, we booked a package through the Grand Canyon Railway. 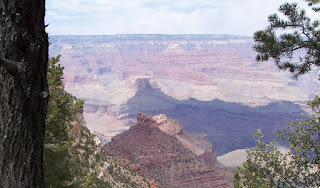 They have packages for two days, three days and four days which include staying at the grand canyon railway hotel, train ride to and from the Grand Canyon and meals at Max and Thelma’s Restaurant. 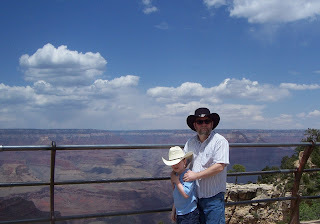 We had learned about the Grand Canyon Railway Hotel from watching “Trains and Locomotives” on RFDTV (one of James favorite shows for a while). So we booked the Canyon Limited Plus for 4 days and three nights for the weekend of May 19th which happened to coincide with “Day out with Thomas”. Thanks to my father, we chose to travel in one of the first class cars on the train. After breakfast at Max and Thelma’s, we were ready to board the train which departed at 10:00 a.m. We were provided with fresh fruit, pastries, coffee, juice and other snacks as we traveled in air conditioned comfort. James meet a delightful little boy named Gabriel and the two of them had fun throughout the train ride. We were entertained by Clarence Clearwater, who sang Indian songs and told us about his life. 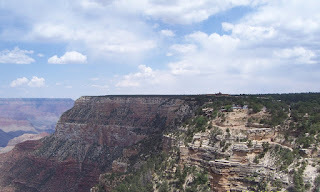 We arrived at the Grand Canyon and hopped on a bus which took us to the Maswik lodge. 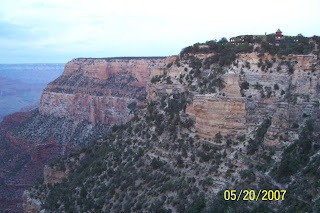 From the Maswik lodge, we walked down to see our first sight of the Grand Canyon. 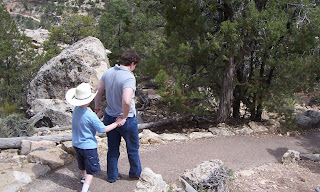 We set off on the rim trail along the Hermits rest route which is approximately 7 miles. We didn't plan of going very far, but just kept walking slowly, adjusting to elevation which was about 7000 feet and enjoying the view. The trail was a little tough for my folks, so they turned back and explored on their own, taking the shuttle bus to Hermits rest instead. We ended up walking .7 of a mile up to the first trail view overlook. As we reached the overlook, the shuttle bus was just arriving and letting off a load of people. We turned around and headed back down. While we rested, James found something to do. Boys will be boys! He cleaned up rather nicely though. 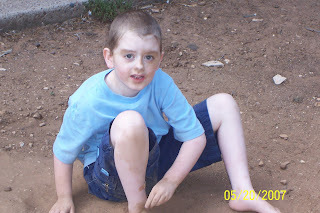 We went to dinner at Bright Angel Lodge, explored some more and took more pictures of course. It was now dark and time to head back to our rooms. On the way to our room, we saw a deer standing under a light. At first I thought it was a statue, until it moved. Other than birds, this was the only deer we saw the whole time. Other than birds, we didn't see much in the way of wildlife. 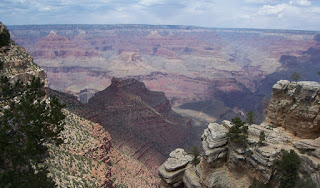 I am sure that if we had wandered down into the canyon, we would have. However, that is an experience we will save for another time.